Sofia + Sam Lap Tray with Tablet & Phone Slots is the perfect lap desk for your home, office, or hotel. Crafted from metal and MDF desk top, this laptop lap tray provides a sleek and stylish touch to your home, office or hotel. Built with a sturdy and durable construction, feel safe using your laptop, iPad, tablet, books, drawing canvas, snacks, food and more on the tray. The lap tray is equipped with folding legs allowing you to set the laptop lap tray at your desired height. The tray table is also equipped with 4 separate tilting positions providing you with comfortable positions to prop up your tablet, book or laptop. The lap desk bed tray has been designed with a tablet slot and phone slot fitting tablets 9.6 inches or smaller and smart phones 3.5" or smaller. Each slot has a hole allowing charging wires access to the phone or tablet when situated within the slot. The lap tray is portable workstation that goes where you go. Simply collapse the lap tray down and easily move it to your next work area. The tray top is also equipped with magnets that help lock the desk top in place when transporting around the home. Continue to work in comfort wherever you are with Sofia + Sam Lap Tray with Tablet & Phone Slots. 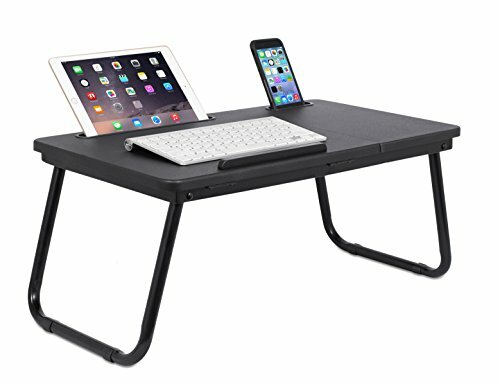 TABLET & PHONE SLOT: The lap desk bed tray has been designed with a tablet slot and phone slot fitting tablets 9.6 inches or smaller and smart phones 3.5" or smaller. Each slot has a hole allowing charging wires access to the phone or tablet when situated within the slot. PORTABLE WORKSTATION (Fits 17" Laptops): The lap tray is portable workstation that goes where you go. Simply collapse the lap tray down and easily move it to your next work area.